Posted on January 26, 2014, in Recovery and tagged 12 step program, 2 Years Sober, AA, Addiction, Alcoholic Anonymous, Alcoholism, Clean and Sober, family, family support, fellowship, Forgiveness, God, Gratitude, Higher Power, I am powerless, just for today, miracles, my sobriety comes first, no coincidences, one day at a time, Parenting, powerlessness, Recovery, Relationships, simplify my life, Sobriety, sobriety infographic, Substance Abuse, success breeds success, Support Groups, xa. Bookmark the permalink. 27 Comments. No, there are no coincidences. Congratulations on reaching your 731st day of sobriety. I’ve never seen the chart above before. I was particularly drawn to no. 19. Thanks so much for the well wishes, glad you stopped by! You’ve never seen it before because they are my top 24 lessons I’ve learned in sobriety, and I created the chart (well, with some help from my husband!). I like number 19 as well… it helped A LOT in the early days of sobriety! I love that chart. I seriously need to print that up and keep it in my daytimer to remind me about the little (and not so little) things to keep me on track. You are such an inspiration to me, Josie. You stay on track, you keep doing the things you need to do and have always been so positive and enlightening. I can learn a lot from you (and do). You have grown a lot in the time I have known you, and you just seem to have more and more confidence in your own voice and in your own skin and that shows in your writing and in your topics. You have accomplished so much in this short time and I am so very lucky to consider you a friend. We haven’t met in the outside life, but I know we’d get on grand! We are close in our sober time, so I consider you a sister-in-arms in many ways. We think alike and go through similar things because of our journeys being so close. so it’s wonderful to have that. Congrats again – I am so happy for you! Paul, that is such a nice way to start my day, thank you so much for the kind words! I want to print it up as well, really want to take it to my meeting this morning, but I don’t have any legal paper 😦 I’ll figure something out. Thanks again for the congrats, it means so much! Yeah that is a great chart – and Big Congratulations!!!!!!!!!!!!!!!! Thanks Mrs. D, I appreciate it. Need to head over to you blog and see how the book is progressing! Congrats on 2 years! Love the chart. I can’t remember ever seeing so many empowering thoughts expressed so well and all at the same time. Thanks so much Ron, for reading AND commenting, your words means a lot to me. I really appreciate that compliment on my chart, I will be smiling all day! WOOHOO!! Go Josie!! I am so happy to celebrate this milestone alongside you. You are a source of strength and hope and inspiration to so many of us. I am also happy that I got to know you in real life too, and now we need to get together to celebrate this. Great lesson chart too. Thanks, Kristen, we ABSOLUTELY need to get together again (so I can see the stone in person :)). Thanks for the congrats, and I would very much like to celebrate live! I am all about anniversaries! Vickie, I could not have done all of this without you, and Starbucks only works if you’re buying 🙂 Seriously, I was thinking of you when I wrote #6! Thanks, Karen, I had some serious technical help with the format, but the words are true beliefs I have acquired in the past two years. I agree… there is such healing within this community! I absolutely love the chart! What an awesome idea. I was trying to pick my favorite one out but I think I love them all! Especially #20 – me too!!! I have use the steps in parenting, especially #3! LOL! I hope you have a great day and enjoy the heat wave – 40 degrees!!! HUGS. As I read this, the heat wave is over, and a sad state of affairs it is that we are calling 40 degree weather a heat wave (and yet I have had the same conversation with no less than 4 people today)! Thanks for the congratulations, it is an amazing thing to look back on the progress of 2 years, it has been a banner day for me! Made all the more banner by hearing from you, so thanks for all the support, it means the world to me! I have been happy all day, and now I’m even happier, having heard from you… thanks for stopping by, Christy! My knee is finally starting to extend to normal position, so get ready for a fitness pal! Thanks, Tracy, and, to respond to an earlier conversation, we are close! I am in Pennsylvania! We had a marginally warmer day today, but it’s already back into the teens. We need to have a serious celebration when this winter is over! Always!! :-) I agree a celebration is in order for all of us who survived this brutal winter!!! Congrats again! I just celebrated 22 years yet I still have days where I feel like I haven’t grown very much!! Yeah! Congrats Josie! 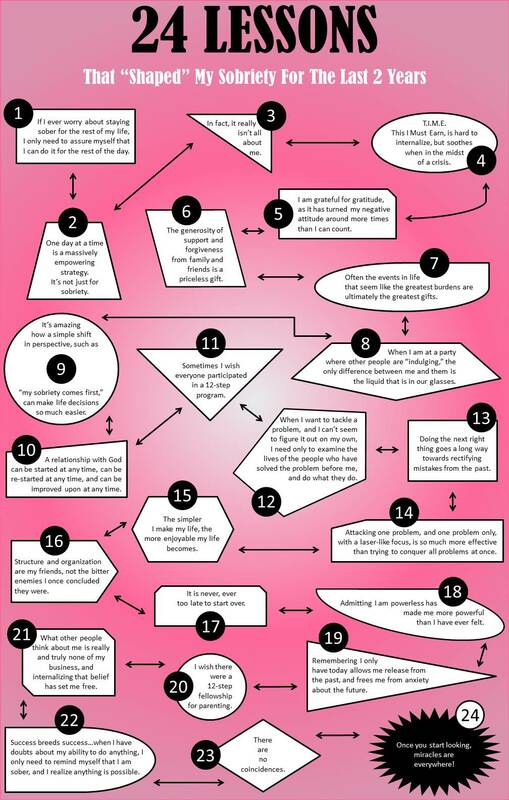 I’m SO happy for you and I absolutely love this chart – especially the part about wishing everyone did the steps! Haha! I’m super proud of you and can’t wait to see the rest of your story! Thanks, Chenoa, I will admit to having SERIOUSLY had that thought, and then I laughed so hard at myself, I had to include it. Congratulations! That’s a lot of sober days and I know it’s not easy so great work! I gather from the responses that you actually made the chart. Incredible. I have legal size paper so I printed it and tonight I will read it as part of my bedtime reading. I need some positivity right about now. Fern, the thought that you are printing that out honestly brings tears to my eyes. Thanks you so, so much for the kinds words and the support, I can’t express truly how meaningful it is to me! Congrats on two years and all of the work you have done! I just passed two years myself and I know how great that feels for ourselves and everyone else around us 🙂 Look forward to reading your blog!